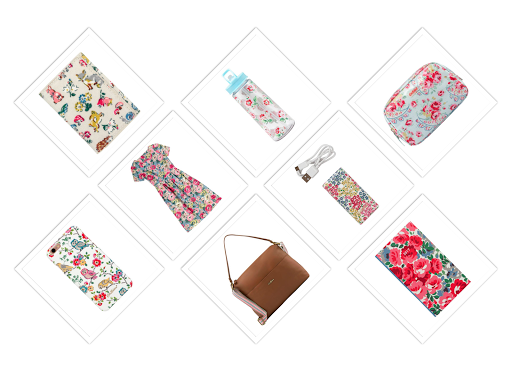 Literally every month I find myself looking on Cath Kidston's website and I always find a whole new set of items to fall in love with... This month they've started to introduce their Autumn/Winter 2016 collection and there are already so many things that I want. Only trouble is, nothing in life is free and I want so many things! One of the more affordable items that I'm listing after is a ticket holder, priced at £6 and covered with cute forest themed animals. I actually need a new oyster holder as I'm forever either losing my Oyster card or hunting around for it in my bag and having a brightly coloured one should solve that. I've also decided that I need some more organisation in my life so I'm thinking to buy a diary with the aim of being more organised, plus because the pattern on the cover is so pretty it'll look nice in my bag which is always a bonus. Another item I feel like I'm going to have to buy is a phone case for my iPhone 6s as I'm forever dropping it. I've had Cath Kidston cases on my phones since I had an iPhone 4 so I can always know that the case will be good quality and last a while, especially considering all the knocks and drops that it'll invitably have to endure from my clumsiness! On a related note, I'm also thinking to invest in a new power bar that I can use to charge my phone on the go; especially since my iPod broke the battery on my iPhone has got really bad (in fairness I do use it practically 24 hours a day) and this bar is very pretty so... Why not? I know both of these items are from the Autumn/Winter collection, but as it's still August and technically summer I'm sure I can justify both - a cosmetic bag and a water bottle, both are essentials for summer weather, as you can keep your make-up safe and reapply it when you need to, and water is always important, whatever the season. I've also fallen in love with two other items and they're completely unnessesary but love is love... The most beautifully patterned dress, which at £75 is super pricey but worth it as I have some other Cath Kidston dresses and the quality is always fantastic using thick cotton material and the print never fades. The final item is also completely unjustifiable but so so so amazing... Actually I've been lusting after this style of handbag from Cath Kidston for a couple of years over several seasons. The price tag is so high, but for a leather, detailed bag that will last for s long time I think it's worth it. This is the first one in tan leather, as opposed to reds and greens and that's what has really swayed me into the belief that it has to be mine, I absolutely love neutral coloured bags as I feel like I can wear them with any outfit and it's also practical as well as its the type of bag that will hold literally everything inside which I definitely need as I carry around so much crap everywhere.